M78 certainly ain’t as hard as the Merope nebula, but it takes some considerable telescopic hardware and dark skies if you want to see it as more than just an oval glow. While it possesses an integrated magnitude of 8.0 and has a fairly small size, the nebula can still be challenging from light pollution. I used to struggle to pull it out of a bright background sky with my 4.25-inch Newtonian from one of the homes I lived in in the 1980s, which was nearly as far downtown as good old Chaos Manor South. One good thing is that M78 is easy to find by star hopping, and was, in fact, one of the first objects I located that way back in the 1960s. M78 forms a near 90-degree triangle with the three bright stars of Orion’s belt, and is located 2-degrees 38’ northeast of Alnitak (Zeta Orionis). When you think you are in the correct position, scan around with a medium power eyepiece. What you are looking for is a magnitude 10 range double star with a separation of about 2.0’. Examine this pair carefully, and if your skies are not too icky, you will see it is surrounded by an oval glow. And that is about all you will see even with larger scopes from light polluted skies. Get to the dark spaces, however, and even a 4-inch will begin to show some details, brighter and darker regions, and the oval will assume a somewhat irregular shape. You should be able to detect at least 3 – 4’ of nebulosity. Up the aperture and/or improve the skies further and you will begin to see that the nebula is fan shaped. 10-inch and larger scopes will also reveal this little knot is just one part of a large complex of nebulosity with other dimmer but similar patches coming into view. I’ve often read that light pollution reduction filters do not work on M78, since it is a reflection nebulosity. The light of the stars, after all, is in the same band of wavelengths as the artificial lights that LPR filters are designed to attenuate. Actually, however, a UHC filter can improve the view of M78 somewhat, since it has a fairly large emission nebula component. One of the big rules of amateur astronomy? Saying something is “impossible” is a sure way to be proven wrong. The sky of winter isn’t entirely bereft of globular star clusters, but it might as well be. Once M15 and M30 and M2 sink below the horizon, you are pretty much left with M79, and the ground truth is that it just isn’t much of a glob. At magnitude 8.56 and with a size of 9’36”, it is on the puny side, and its declination, -24-degrees 30’, means it is a trifle low for more than a few Northern Hemisphere observers. Still, it is the only Messier glob game in town for a while, so let’s get after it. Finding is not terribly involved if your southern horizon is mostly unobstructed. M79’s home constellation, the little hare, Lepus, crouching at the feet of Orion is easy enough to make out in the suburban backyard. Naturally, however, as is usual with constellations, it doesn’t look a thing like what it is supposed to represent. That’s wight, wabbit, this bunny looks more like a capital letter “I” (as in “India”). The glob itself forms a near equilateral triangle with Epsilon Leporus and Beta Leporis, and should show up in 4-inchers without a fuss, albeit just as a small, subdued round glow. Its Shapley – Sawyer class of V means M79 is almost right in the middle as far as concentration goes. Not too compressed, not too loose. That does not mean it is easy to resolve in the backyard, however. Often an 8-inch SCT won’t quite do the job, even at high power. Oh, you might get a few stars in the periphery winking in and out, but convincing resolution at home requires my 10-inch Dobsonian, Zelda. 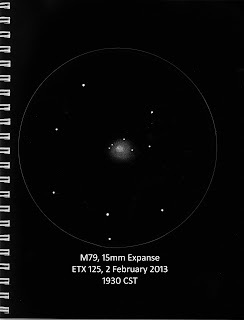 Naturally, it’s easier at a dark site, and in 12-inch and larger scopes under good skies, M79 almost begins to look worthy of its Messier designation. 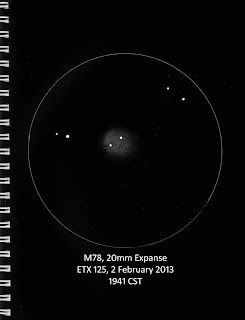 M79 is better than some of the puny globulars of Sagittarius, but not as good as Coma’s M53. Still, its solo status in the winter means it will give you some chucks during otherwise glob-free times. If M79 is not exactly highly concentrated, M80 is very highly concentrated, being rated a II on the 12 step Shapley-Sawyer scale. That brings good and bad. Combined with its bright magnitude, 7.87, and its relatively small size, 10.0’, this glob stands out like a sore thumb even with Scorpius is low in the sky. But its compact nature also makes it something of a bear to resolve. The cluster is easily located by searching the area 4-degrees, 28’ northwest of bright Alpha Scorpii, Antares. Be careful, however. Since it is small and compact, M80 can most assuredly masquerade as a bloated star at low magnifications in smaller scopes. Use medium power, 100x and up, and examine each field carefully, however, and you will be rewarded. What exactly will your reward be? That depends on your magnification and the aperture of your telescope. In a 4-inch or smaller instrument, the cluster will be easy, but even at higher magnifications it will not be resolved. What it will look a lot like is a bright elliptical galaxy, with a brighter middle and a diffuse halo. Alas, an 8-inch or even a 10-inch in a suburban yard won’t deliver much more than the above, with an 8-inch sometimes failing to resolve any stars at all unless the conditions are good—the cluster is near culmination on a dry, transparent night. A 10-inch is better. On an average suburban night, one will show the cluster as a grainy appearing ball, and upping the power will bring home a sparkler or two. Even at a dark site, however, I find a 12-inch is required for a truly outstanding view of this tough-nut globular. 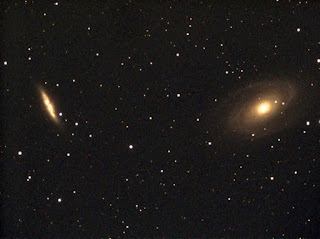 The galaxy pair of M81 and M82 isn’t just good, it’s one of the outstanding destinations in the list, right up there with the likes of M42 and M13. How can it be otherwise? Here, you’ve got two bright galaxies, magnitude 6.94 M81 and magnitude 8.41 M82 separated by just a bit more than half a degree. Not only can you fit them both in the same field using a wide-field eyepiece, even with fairly large aperture scopes, they are both potentially detailed and worthy of much inspection. Here’s the thing about M81, y’all: while it is a beautiful sight, in the suburbs its beauty is mostly due to its association with M81. While the central portion of this intermediate inclination galaxy is “bright,” the outer disk and spiral arms are quite subdued. It’s large, almost 27’ across, so the light is badly spread out. The only decent looks I’ve had of this Sab spiral’s arms, which are like wisps of gossamer, have been from dark sites with larger apertures. From a truly superior site, a 12-inch will reveal them easily, as my 12-inch, Old Betsy, did one memorable night in the 1990s at the Texas Star Party. At less good locations, you’ll want at least 16-inches of aperture for a good look. Under average conditions at average dark sites with a medium-sized telescope, you’ll likely see about what I saw with my C11, Big Bertha, back in May of 2004 from the old Georgia Sky View Star Party at Indian Springs State Park. Under hazy conditions, M 81 is still bright and attractive. 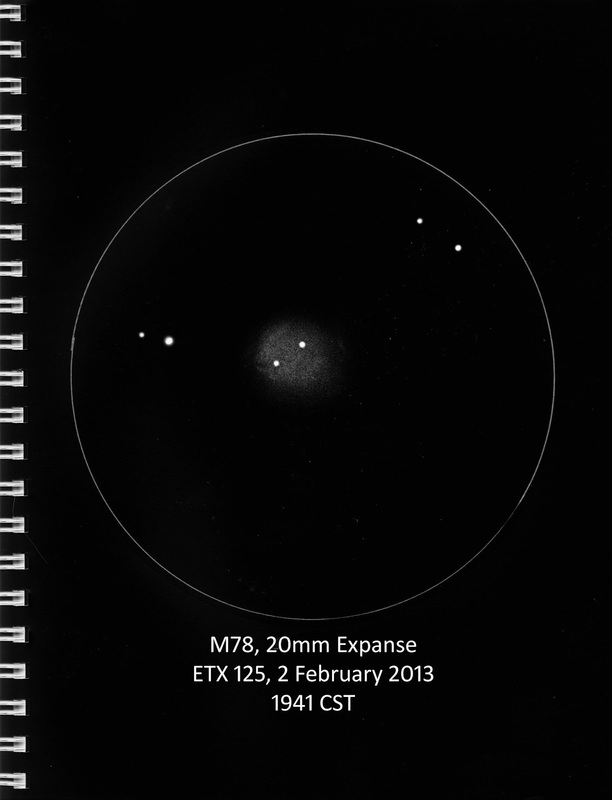 Stellar appearing nucleus in TeleVue Panoptic 22mm at 127x. Considerable oval haze extends out from the central regions n/s. No hint of the very subtle spiral arms tonight. Much the same in the 12mm TeleVue Nagler at 233x, though the nucleus looks smaller at this higher power when the seeing settles. 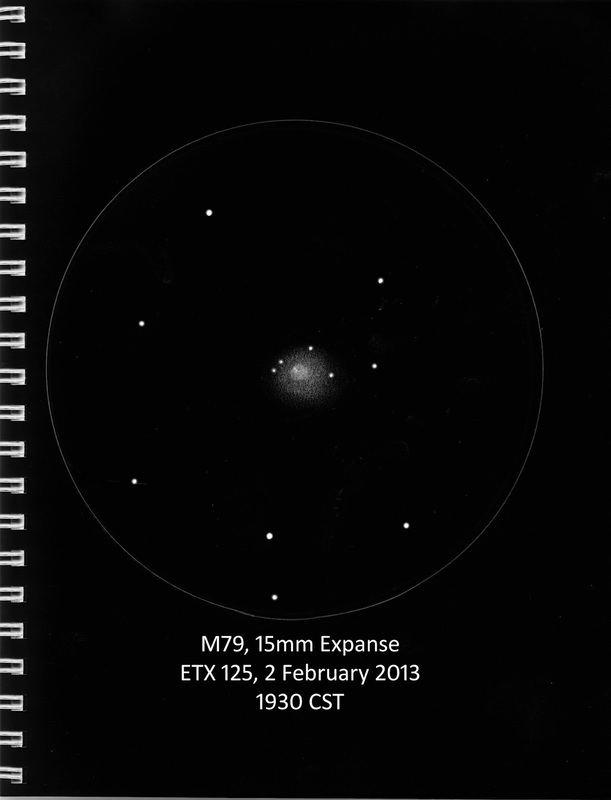 M82, conversely, gives up detail to 6-inch telescopes in suburban backyards. It’s bright, nearly edge-on, and there are plenty of details to be seen in the Cigar Galaxy, which my daughter, Lizbeth, used to call the Exploding Cigar Galaxy. It is "Exploding" because it’s disturbed, likely from a long-ago interaction with M81, and is criss-crossed by dark lanes and festooned with bright patches. The more aperture you use on this 9.3’ long galaxy, the more you’ll see. Don’t be afraid to pump up the power, either. Under good conditions, 200x is nice for the Cigar with an 8-incher. M82 in the TeleVue Nagler Type 2 12mm at 233x is amazing. Bright star in the field, about 30" from the galaxy. Dust lanes cross the galaxy’s thin disk (about 4’) and divide it into three distinct sections. Some of the best views I’ve had of M82 have admittedly not been visual ones. With my Mallincam Xtreme video camera and the C11, the galaxy is just incredible, showing not just intricate dark lane structure, but almost psychedelic red matter being emitted from the galaxy’s center. Amazing. How do you locate this magnitude 7.8, 14.1’ galaxy among the southern stars of Hydra? If M83 is low in the sky for you, DSCs or goto will make your task easier, but it is really not difficult to pin down with star chart and finder scope. It lies about halfway along a line drawn between Menkent (Theta Centauri; I told you this was a southern object) and Gamma Hydrae. M83 is prominent enough that you should pick it up easily in a medium powered wide-field eyepiece without further direction. M83, a magnitude 7.8, 14.1'x13.2' spiral, has a dramatically bright stellar core and a large, mostly round outer envelope. Spiral structure pops in and out of view. I do have to be careful not to “see” what I expect to see given the images I’ve seen and looks I have had of the object in larger scopes, but the arms are just not that difficult. The galaxy's bar is easy. M83 is another wonderful target for a deep sky video camera, and shows amazing detail and color in the Xtreme, and also in my inexpensive Revolution vidcam. M84 is that most common of Virgo beasties, a bright, round elliptical galaxy. Oh, this object’s field makes for a great view, but not because of M84 itself. It’s brilliant (for a galaxy) at magnitude 10.1 and only 6.3’ across, but, as is usually the case with ellipticals, there’s just not a lot to see—a bright round fuzzball that looks like a small, unresolved globular star cluster. If goto can make finding M83 more pleasant, it can make finding M84 much more pleasant. There are so many bright galaxies within the arms of Virgo that it’s hard to know which one you are on. Luckily, the field here is pretty distinctive. If you simply must find 84 the old fashioned way, it lies halfway along a line drawn between Epsilon Virginis, Vendemiatrix, and Denebola, Beta Leonis. Positoned there, look for two bright fuzzballs about 17’ apart. Which is M84? It is the southwestern fuzzball. It is also rounder-looking than the other galaxy, M86. M84 is a Hubble Type E1, while M86 is an E3. What just tickles me about this field? You’ve heard of The Eyes, two bright galaxies just to the east of M84/86? Well, M84 and M86 to me are “The Face.” The two big galaxies are the eyes, a small elliptical, NGC 4387, is the nose, and an edge-on, NGC 4388 is the mouth. The effect is so comical that I can’t help smiling every time I land on this field. Which is also beautiful, of course, because it is part of Markarian’s Chain, the line of bright galaxies stretching off to the east. A look at this area with an 18 – 20-inch telescope from a dark site is a mind-blower, and has almost impelled me to buy a really large Dobsonian a time or two. And that does it for another M batch. Next up? I’m not sure, but it certainly doesn’t look like I’ll be doing any observing any time soon. The weather this time of year on the Gulf Coast simply doesn’t encourage that. Oh, things will improve as they always do, but not until late October usually. Until then? We may take a break from the Ms for a week or three and talk about another favorite observing list of mine. Thanks for another nice blog. I've noted the 125 ETX is back again, hopefully the new ones prove to be nice units like yours.